As fas as you know, is there a case for Apple 1 ready to build? Yeah, I saw this and it’s really awesome but I meant available as a kit to buy. The only case consistently used for the Apple-1 is the Byte Shop commissioned one and only a handful survived so there really isn’t a standard “case” to target and put your Mimeo in. If your not big on wood working you have a few options. First no case at all. Simply put it on standoff’s. Second, get a shadow box with a hinged front panel and place it there. Third, simply mount it on a piece of precut plywood or butcher block. 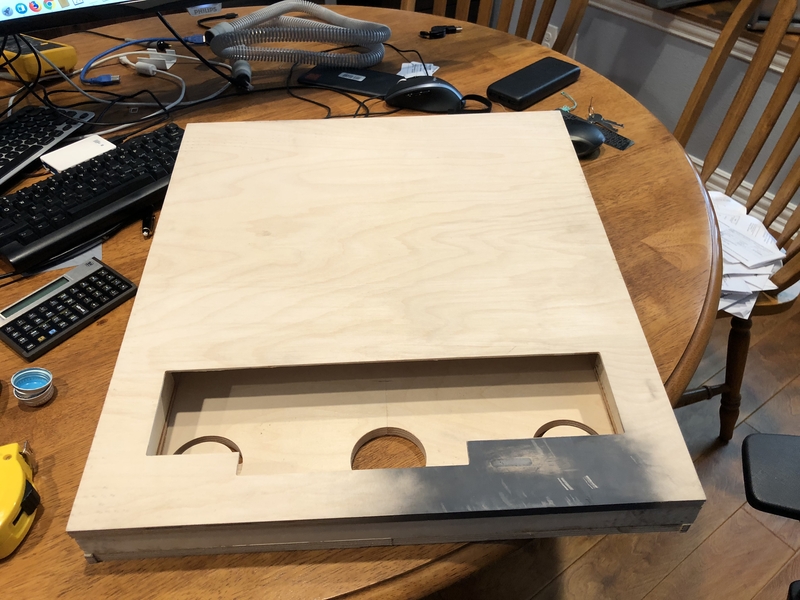 Even mounting inside of a briefcase requires some wood working skills since the briefcase will need reinforcing. My “demo” Mimeo is in a briefcase and to keep the transformers from breaking loose I had to reinforce the area where they are mounted. The final option is to buy/build a plexiglass box and drill it. The problem is you can easily crack the plexiglass if you don’t know how/have the right tools to drill the plexiglass. Has anybody attempted to make a replica of Apple's case - the sleek blue one? Are you referring to the one at LCM in Seattle. That “demo” unit’s case is the only one of its type. 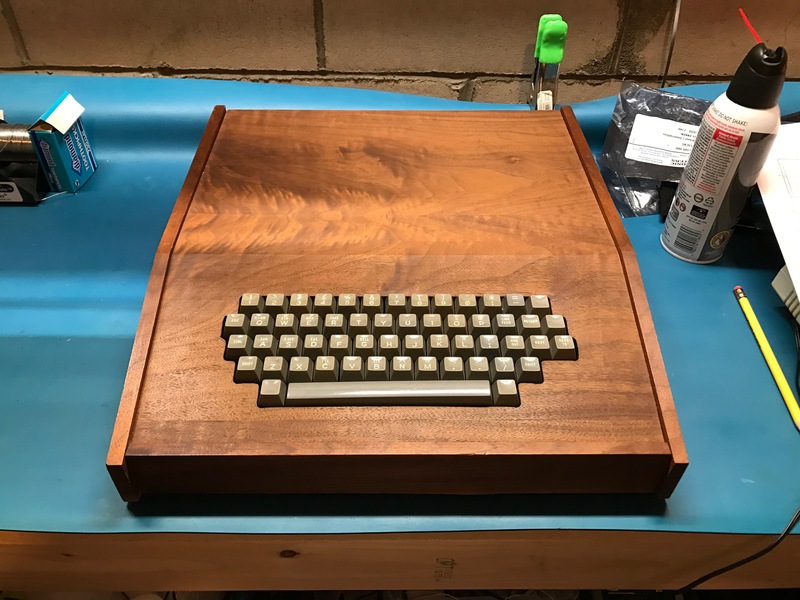 The only Apple-1 case you could buy in 1976 as I mention above is this one commissioned by the byte shop, but sold separately so not many were bought and survived. Yes. Has anybody attempted to make a replica? Not that I’m aware of. We could ask LCM for measurements, they may have them already. As it happens, I've been working on something close. 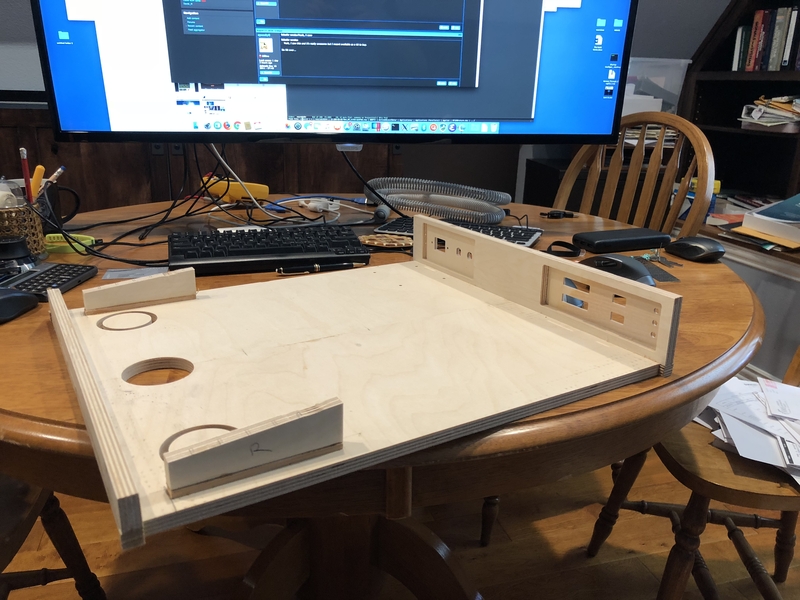 Not a kit, but CNC-ready plans for a set of universal computer cases in 1/2" plywood. I'm trying to come up with a couple of simple, attractive designs that are easy to make. The first design is a wedge for the Apple 1, Superboard 2, and other single board designs like the AIM 65, homebrews, etc. Here are some photos of the unfinished prototype. I should have this finished and painted in the next week or so, so I'll post those photos so we can see how it turns out. The basic idea is that the bottom and back are fixed, and the keyboard is attached to the bottom, so you can remove the lid and troubleshoot the system without unscrewing anything. I'm trying to minimize the keyboard angle for ergonomics, which is why I went with the whole-length wedge. If the top were flat, the keyboard would have to be high up, or the angle would have to be steep. In this prototype, the back and front panels are a full 18" wide, but the bottom is only 17" wide (to accommodate the 1/2" sides. That leaves a small empty pocket in each bottom corner--you can see the small blocks I glued in place to fill them. That is fixed on the newer rev, where the entire bottom assembly is 17" wide, and the side panels cover up the front and back panels. The newer rev also makes the back panel a bit taller, to allow a flush fit between the top and back pieces. The new rev has a pocket and cutout pattern for a 4" fan, if desired. There are cutouts for IEC power connector, fuse holder, and switch. The I/O cutouts are for a pair of DB-25, a pair of DB/9, and 3 phono jacks, but all can be customized. Different machines would have different keyboard cutouts and widths, of course. It will certainly be possible to create a variant with a cutout in the middle of the top piece and wedge-shaped mounts to angle the computer PCB at 5.3 degrees just like the keyboard, and have a custom acrylic cover made, just like the beautiful hand crafted case linked at the beginning of this thread. There are a couple of options for placing the monitor on top of the case. One would be to use a stand made out of wood, plexiglass, acrylic, etc. that fits over the computer case. Another would be to place a small wedge on top of the case to angle the monitor flat or slightly upward. Or, the monitor could be placed off to the side. These will be available as Vcarve files, and DXF files, along with DXF files for various keyboard cutouts. 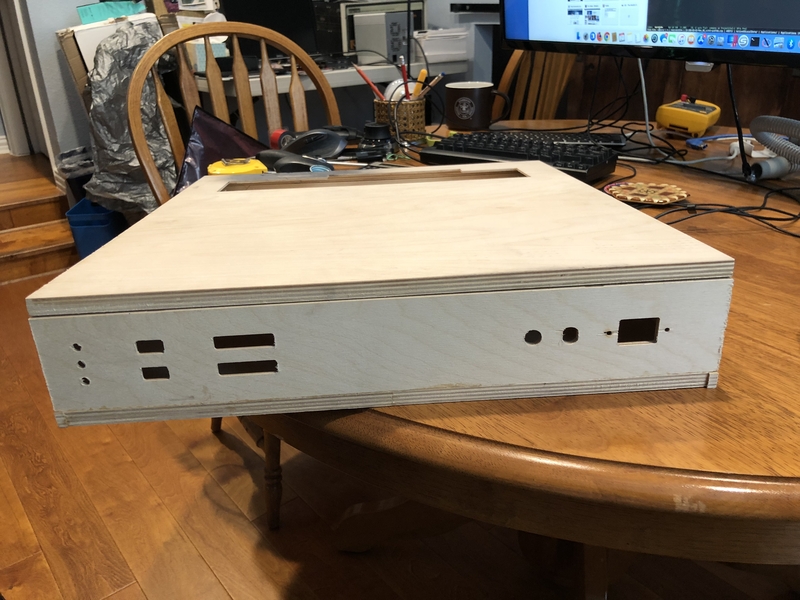 After this case is validated, the next case design is going to be a slab design with a flat top and low, flat keyboard that would be a bit more universal, a bit less sleek with all 90 degree angles, which would work for Apple 1/2, OSI C1/2/4, and others. That was actually my original design, before I decided to do a wedge, so the design files already exist, but just need to be tuned up and proven out. Interested in thoughts and feedback. 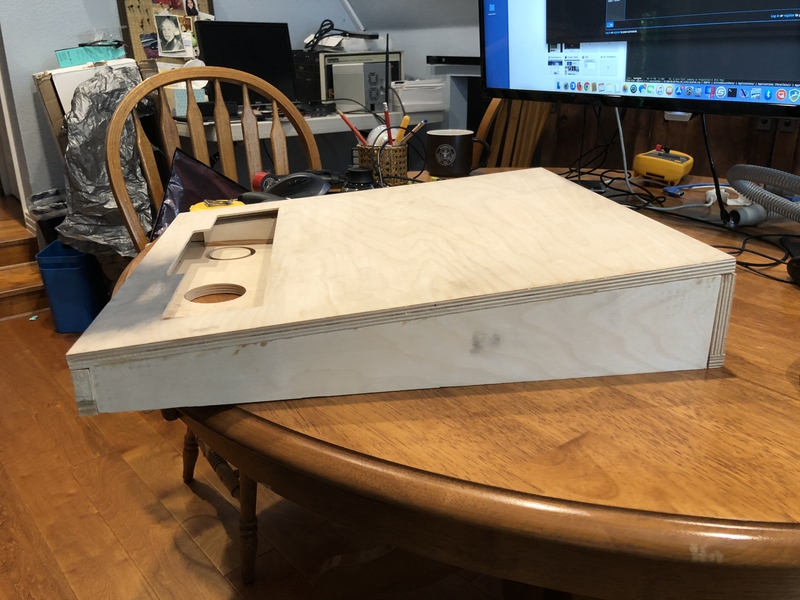 Also, I have tried out this lap desk and it will fit both the Replica 1 and the Mimeo 1, but it's very tight if you want to mount the transformers inside along the back panel. Also, the keyboard is higher off the table than I would prefer. You can use a jigsaw to cut out the keyboard, and a chisel to create pocket on the back side of the keyboard mounting area, to allow it to sit flat. I have one set up with the Replica 1, but haven't finished the back panel cutouts. I'll see if I can take some photos of this. it looks like that lap desk is now unavailable on Amazon and a little google'ing shows that they are going out of business. BTW; Here a bigger pic of the Fish Apple-1 that is on the cover of Tom's book. This is the byte-shop commissioned case. For those wondering, the space bar was an easy fix. The metal guide wasn't snapped in. Bummer--I didn't notice it's not available any more. Where did you upload the image to Corey?